Bonus Video Tutorials at the bottom of this page ~ How to make a Miniature Dollhouse Cake & How to make a Cake Stand with polymer clay & How to make a Cake Stand from findings! 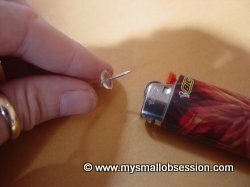 Carefully use the lighter to heat the metal part of the push pin. Be sure not to get to close to the plastic or it will warp. Use pliers to gently pull the pin out of the plastic. Pull out the pin as straight as possible because the plastic is pliable from the heat and will bend. 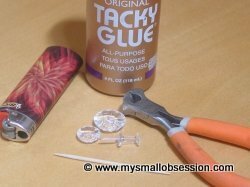 Use your toothpick to add a small amount of glue to the smaller button. Place the narrower end of the push pin into the button and allow to dry. Add a small amount of glue to the top of the push pin, add larger button and allow to dry. 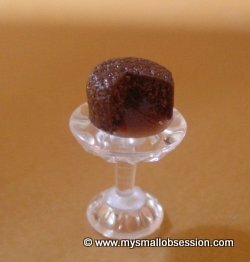 Add a miniature cake! My cake is Chocolate Lava, made by my friend Brenda. Learn how to make a miniature layer cake for your dollhouse by IGMA Fellow Betsy Niederer, Make A Miniature Cake or watch the video below.